Seventy years after the historic raid on Japan, secrecy and unanswered questions still remain. 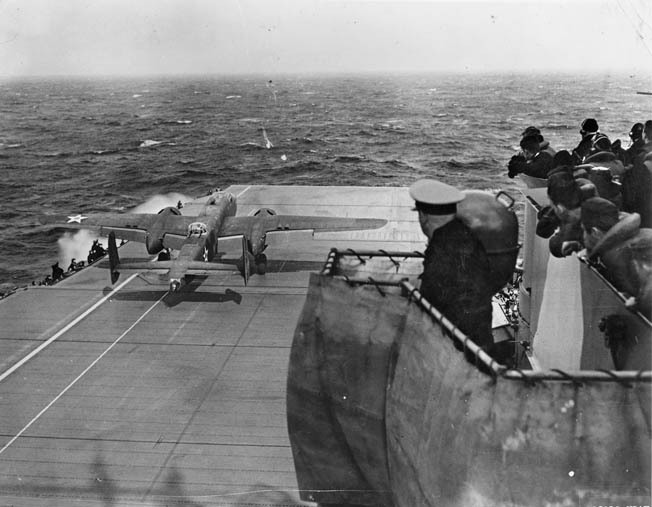 April 18, 1942, will forever live in American military glory as the date of the Doolittle Raid––a gutsy, never-before-attempted combat mission to fly North American B-25 Mitchell bombers off the deck of an aircraft carrier and attack an enemy capital. Although the damage from the bombing of Japanese targets was a blip on the screen compared to the devastation that Japan delivered to Pearl Harbor, this American retaliatory action shattered the island nation’s inscrutable veneer and reminded the Japanese that they, too, were vulnerable. Although it came so early in the war, the raid launched the beginning of the Land of the Rising Sun’s downward spiral and eventual defeat in World War II. The Doolittle Raid was America’s first joint action with the Army Air Forces and the U.S. Navy. This groundbreaking mission shipped 16 B-25B Mitchell land-based bombers and their five-man crews aboard the aircraft carrier USS Hornet to within 500 miles of the Japanese coastline. The mission climaxed with the planes bombing Tokyo and other industrial centers. The leader of the improbable raid was the legendary aviator and World War I pilot Lt. Col. James H. “Jimmy” Doolittle. Because the success of the raid depended entirely on the element of surprise, there was a code of silence so widespread that paper trails were often nonexistent and information cryptic. Two days after the raid, the U.S. War Department reported the mission to America but not its staging point. President Franklin Roosevelt maintained this clandestine air by coyly saying the pilots had taken off from “Shangri la,” in reference to English author James Hilton’s 1933 best-selling book, Lost Horizon. The raid began and ended in secrecy and, some 70 years later, the secrecy still flies high––the mysteries of the Doolittle Raid remain. 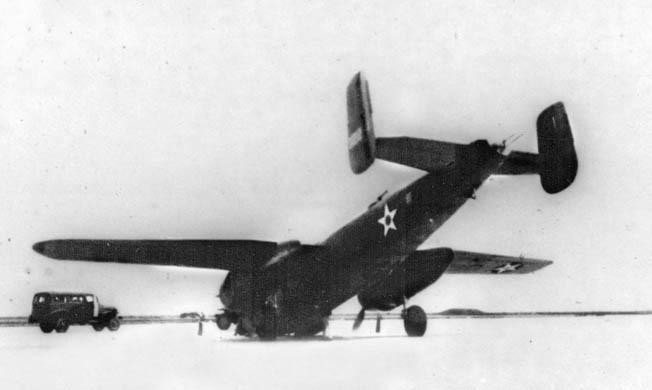 The eighth plane to take off from Hornet was the only B-25 that became mired in controversy due to its inauspicious landing in Russia and the aftermath. Although all 16 of the planes were low on fuel due to the forced premature launch from the carrier, all 15 headed for China after dropping their bombs. Plane 8 broke ranks and landed in Vladivostok, Russia. An air of complicity that the landing was “ordered” has tailed the plane and crew ever since. There were many questions that plagued Lieutenant Nolan A. Herndon, the bombardier-navigator on Plane 8 who, along with pilot Captain Edward J. “Ski” York, co-pilot Lieutenant Robert G. Emmens, and two other crewmen, was interned for 13 months in Russia after the unauthorized landing. Herndon felt that the true reason for the detour was to test Russia’s wartime allegiance and find out if their plane would be permitted to refuel and continue to China, and also to collect information about Russia’s airfield for use in possible future attacks on Japan. Herndon believed that both Emmens and York were privy to the flight’s surreptitious purpose. 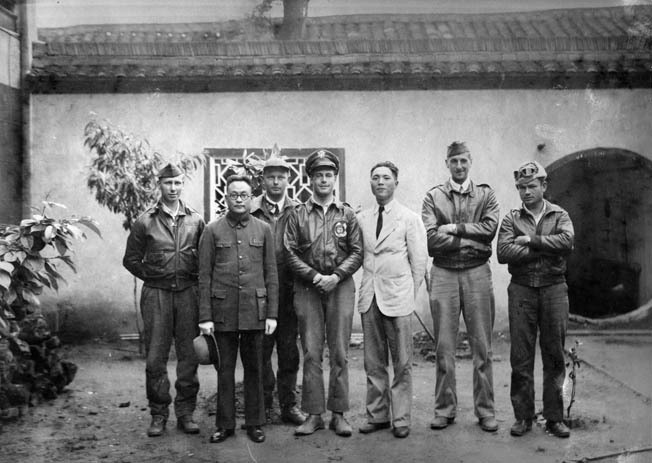 The crew of Lieutenant Travis Hoover’s Plane 2 pose with Tung-Sheng Liu, in white jacket, who helped the crew escape capture. Liu later immigrated to the United States and was named an honorary member of Doolittle’s Raiders. While the defining document instructing Plane 8 “off course” remains elusive, there is a significant black-and-white paper trail that leads to Russia’s landing fields. 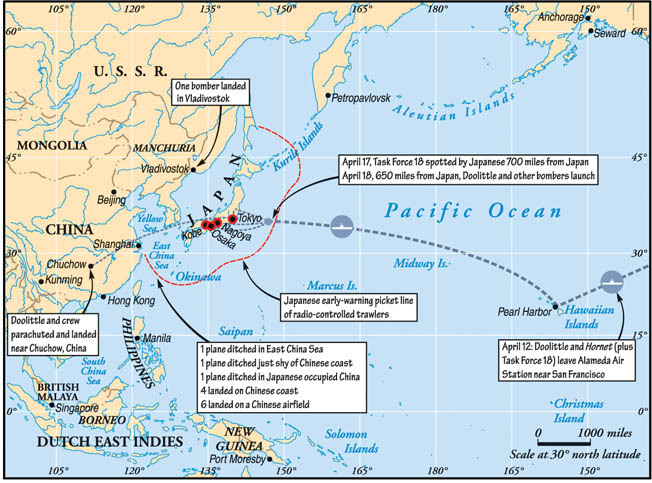 The very last line in Doolittle’s February 1942 feasibility report to General “Hap” Arnold states, “Should the Russians be willing to accept delivery of 18 B-25-B airplanes, on lease lend, at Vladivostok our problems should be greatly simplified.…” Vladivostok was some 600 miles from Japan, while China’s fields were double that distance, hence Russia’s cooperation would have simplified matters. The United States had its eye on Russian soil for the post-bombing landing as evidenced by Doolittle’s report and the Lend-Lease Program enacted on March 11, 1941, which provided billions of dollars of war matériel to the Allied nations including the Soviet Union. However, the Soviet Union wanted to keep its distance from the United States, so the mission went forward without Russia’s cooperation and the 15 courageous crews either bailed out over or crash landed in China due to low fuel, except for one. Debriefing papers that were filed following the raid by Plane 8’s pilot, Captain York, fueled Herndon’s suspicions. York reported low fuel as his only reason for flying to the Soviet Union and also provided significant information about the airfields around Vladivostok. “In the later years of the war, 250 U.S. pilots flying B-17s from Alaska’s Aleutian Islands would seek refuge in the Soviet Union,” he wrote. The Doolittle Raiders official website corroborated other events with its own repository of military reports and records from the raid. A rather incriminating disclosure revealed that Herndon once asked Doolittle about the flight to the Soviet Union and received this cryptic answer: “I’ll tell you one thing, Herndon: I didn’t send you there.” Doolittle’s rather sideways response spoke volumes. If he didn’t send him there, then did someone else? And, if so, who? The crew of B-25 #40-2344, the lead bomber (left to right): Lieutenant Henry A. Potter, navigator; Lt. Col. James H. Doolittle, pilot; S/Sgt. Fred A. Braemer, bombardier; Lieutenant Richard E. Cole, co-pilot; S/Sgt. 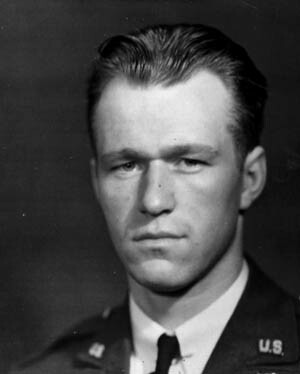 Paul J. Leonard, flight engineer/gunner. Emmens’s admission that Plane 8’s crew formed at the 11th hour leaves the door wide open for speculation as to why this plane was ever called into action. There were 24 crews (though only 16 would fly the mission) that spent three weeks at Eglin training and honing the critical carrier take-off skills––except for Plane 8’s crew. All the planes had their carburetors carefully adjusted at Eglin to fly the 2,000-mile mission without refueling––except for Plane 8. So, why were an untrained crew and unadjusted plane called into service when there were already modified planes and trained crews at the ready? Maybe someday those instructions for Plane 8’s “AWOL” flight will surface, which might also explain why York and Emmens just happened to start speaking fluent Russian when the plane touched down in Vladivostok. Until those papers surface, however, the true story of Plane 8 remains up in the air. A secret B-25 flight from Long Beach, California, to Gary, Indiana, that tested the bomber’s maximum range was then—and still is—completely off the radar screen. In January 1942, when the top-secret raid was on the planning table, it remained to be seen if a land-based bomber could take off from an aircraft carrier and go the distance. On February 2, 1942, the well-known Norfolk, Virginia, test flight off the Hornet proved that the B-25s could get in the air. Then, sometime later that month, the distance was put to the test with the mysterious Long Beach flight. Crew of Plane 8, interned in Russia (left to right): Lieutenant Nolan A. Herndon, bombardier/navigator; Captain Edward J. York, pilot; Sergeant Theodore H. Laban, flight engineer/gunner; Lieutenant Robert Emmens, co-pilot; Sergeant David W. Pohl, gunner, not shown. The only known story about this flight appeared 61 years later in the Fall 2003 (September) publication of the Jimmy Doolittle Air & Space Museum Foundation NEWS at Travis Air Force Base in California. In Fernando Silva’s article, “Behind the Scenes of the Doolittle Raid,” he explains that in February 1942 his father’s crew (separate from Doolittle’s men and planes) was instructed to fly a B-25 “configured to carry a dummy bomb load of 2,000 pounds” from the Long Beach Airport (then a USAAF Air Transport Command Base) to Gary, Indiana, near Chicago, while another crew flew a separate mission to Canada. According to Silva’s article, the flight’s purpose was “to determine the maximum range that could be squeezed from every drop of gas by setting the correct throttle, prop pitch and mixing the controls … raw data was then turned over to North American Aviation’s engineers.” Since the B-25s used in the raid were manufactured in Inglewood, California, about 15 miles from Long Beach, that would have given the test flight access to an unmodified B-25 for the 1,700-mile flight to Gary, which approximated the raid’s greatest distance. The cloak of secrecy surrounding the mission kept many events in the dark, especially this maximum range test that called for a “fly through the Grand Canyon and as close to its walls as possible,” then to “fly at tree-top level all the way to the steel mills of Gary, Indiana.” Although there are no known witnesses to the canyon’s fly-through in 1942, historian Mike Anderson, who has worked in the canyon for the past 20 years, has seen military jets fly through the inner gorge, which puts them as close to the walls as possible. America’s grand geographical icon is no stranger to the military. In an October 3, 1920, memo, Lieutenant Harry Halverson detailed his photographic military flight over the canyon to Major Henry “Hap” Arnold. Some 20 years later, Arnold and Halverson would both coordinate missions in conjunction with Roosevelt’s order to come up with a retaliatory raid following Pearl Harbor. Arnold would be involved in the Doolittle Raid while Halverson would direct his namesake project (aka HALPRO), a series of land-based attacks from China (which were rerouted and bombed the oil facilities at Ploesti, Romania). Top-secret training for the mission was not without risk. This B-25 crashed at Ellington Field, Texas, March 10, 1942. The “facts,” according to Glines, were, “No such long-range test flights took place. All arrangements were top secret. The aircraft were flown from Pendleton, Oregon, to Columbia, South Carolina. The B-25s were modified en route by the addition of fuel tanks in the bomb bays and crawlways of each aircraft; none of this work was performed in California. The B-25 could not have flown the distance required if these extra tanks had not been installed.” There are two sides to every story. Map showing the routes and the landing or crash sites of Doolittle’s Raiders. Members of the Hornet crew watch anxiously as one of 16 B-25s lifts off, April 18, 1942. Just like the eighth plane, the California flight’s paper trail lies scattered to the wind. The fact that to date both the Silva and Glines stories remain on the museum’s website reflects the depth of the ongoing secrecy surrounding the mission. Because no one at Sacramento knew the critical purpose of the work, the request for four 500-pound practice bombs took three different officers at three different bases over two hours to decipher and sort out. Unbekownst to everyone, the bombs were needed to test that the plane’s bomb release mechanism still functioned after the fuel tanks were reinstalled. Urbani: I am trying to find a 500-pound practice bomb. Cotton: A 500-pound practice bomb? Urbani: Do you have anything over there like that? Cotton: There is a bomb sitting over at the end of the ordnance warehouse that looks about like that. I can contact ordnance on the telephone and let you know. Urbani: How about calling me back? Cotton: They may be out to lunch, but I will call you back in an hour or so. Urbani: We have to get this bomb right away. It is for the Doolittle Project and they are not going to be here very long. Cotton: If I can find one I will call you right back, and if I cannot find somebody who knows what it is all about, I will get them right after lunch. Despite pitching seas, a B-25—probably Doolittle’s—takes off from Hornet en route to Japan. Urbani: I am after four 500-pound practice bombs. At least four if I can get them. They are for the Doolittle flight. They have to use them up here as sort of a dummy or something to try out something. Can you tell me where I can get them? Kenzie: Where do you want them? Urbani: I want them up here at the field. Kenzie: Up there at the field and you want four of them? Kenzie: I will ship them in there just as soon as I can. I will call you back and tell you when they will get there. Urbani: They will have to be here this afternoon if they are going to be any good to us. Kenzie: We will get them there if it is at all possible. Urbani: All right, sir, thank you very much. About 10 minutes later, at 12:40 pm, Kenzie called back and spoke to Urbani’s secretary. Kenzie: I just talked to Major Urbani about these bombs. Do you know what he is talking about? Secretary: He was asking for four bombs for Colonel Doolittle’s flight. Kenzie: What kind of bombs did he want? 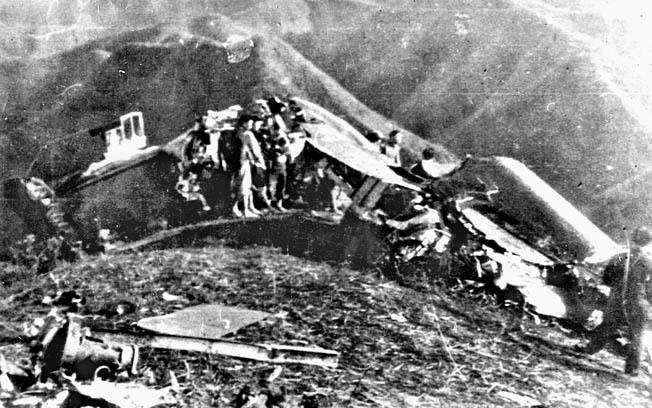 Wreckage of Doolittle’s plane on a Chinese hillside. 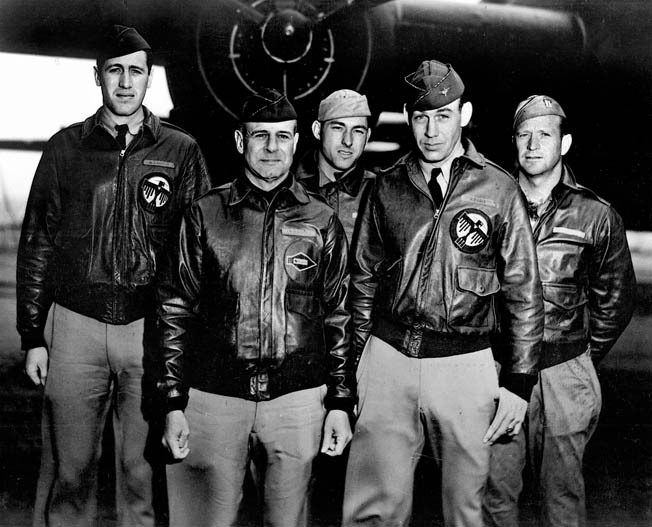 Doolittle can be seen center right. Secretary: He wanted 500-pound bombs so that they could be emptied and filled with sand to make up the weight. That is all the information I can give you on those. Kenzie: Will you leave this note for him? Kenzie: We do not have any 500-pound practice bombs, but we have 100-pound practice bombs at the Sacramento Municipal. We have 500-pound demolition bombs, which you could take without the fuse for the 500-pound weight. Would you ask him to call me as soon as he gets back? Secretary: He will be back in a few minutes and I will have him call you right back. Kenzie: I will wait [for] lunch until he calls. Urbani: On those bombs, I found two training bombs at Hamilton Field Ordnance. They said I would have to go through you to get them. Kenzie: We can get them for you, but here is the thing––how about using those 500-pound demolition bombs at Sacramento? Take them without fuses. Urbani: Without fuses? I do not know. This is for Colonel Doolittle’s job and they wanted the 500-pound practice bomb. Kenzie: We do not have any practice bombs. Urbani: They said something about the old type and the new type; I could not quite gather it all. They said that there were two different types of bombs. Kenzie: We do not have any 500-pound practice bombs. Urbani: Those demolition bombs must be down at the Municipal [Airport], is that right? Kenzie: Yes, they are right here at hand. Urbani: All right. I will tell them about that. There are two practice bombs at Hamilton Field, and if they want them, we will have to get an OK from you. He will let you know later on it. Kenzie: I do not know about these practice bombs being over there; we have no record of that, but we have what we call a drill bomb. Urbani: That is it, a drill bomb. Kenzie: There is a difference in those. The practice bomb is the one that we take up and drop from the air, and the drill bomb is strictly a ground bomb to practice loading and unloading. Urbani: All right. I will tell them about those demolition bombs and use them without the fuses. They will weigh pretty close to 500, will they not? After it finally came to light some 45 minutes later that Doolittle wanted the bombs for size and shape, Urbani opted for the drill bombs. It was 2:45 pm when Urbani called Kenzie once again. Urbani: We will have to borrow those two bombs down there, the drill bombs, if we can get them. If you will have them released, I will send a truck over there right away. Kenzie: We can get them to you much faster by just putting them on a truck and sending them up. Urbani: That will be fine. Then we can give them a load of supplies going back. Will you see that he gets off this afternoon? Kenzie: I will have them contact you when they arrive at the field. Urbani: I will leave word here in case I am gone, so they will watch for him. Thank you, sir. Urbani’s conversation was symptomatic of the “no-questions-asked” orders that delayed getting the job done. He was completely in the dark that the success of the raid required a properly functioning bomb-release mechanism. 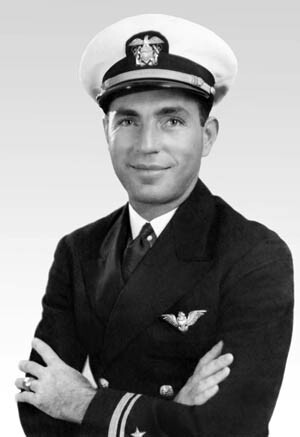 The 32-year-old flight deck and intelligence officer aboard Hornet who prepared the raiders for their day of reckoning with Japan was Lieutenant Stephen Jurika, Jr. His two-week crash course was pivotal to the success of the raid. As the carrier sailed across the Pacific, Jurika briefed the crews on their flight routes, Japanese targets, the country’s history, politics, and even psychology. Colonel Charles Greening, pilot of Plane 11, wrote a report in 1948 about the raid that mentioned preliminary tests. Jurika was made to order for the mission. He came aboard with an extraordinary dossier on Japan. In just under three years he served as a naval attaché in Japan, then in the Office of Naval Intelligence, and finally aboard Hornet. His military service reads like an open book, but Jurika’s own dossier makes for some interesting reading. 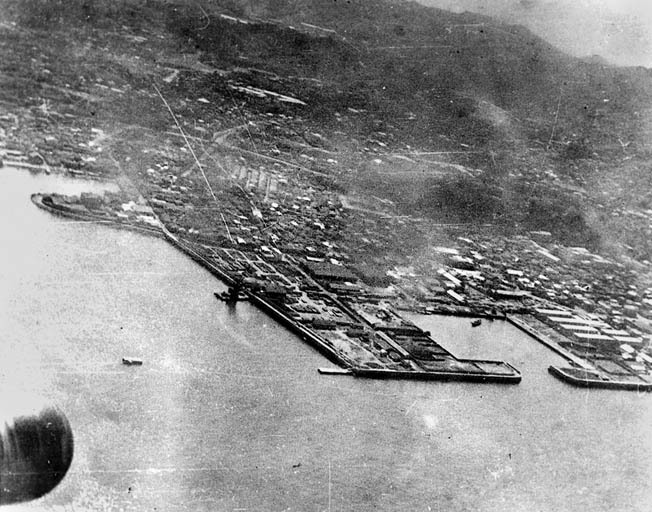 A photo of the Yokosuka Naval Base, south of Tokyo and Yokohama, probably taken from a window of Plane 13. The surprise raid—payback for Pearl Harbor—shattered Japan’s belief of invulnerability. For a nation not at war, Jurika’s work seemed to indicate otherwise. On September 1, 1939, Roosevelt had promised to stay neutral, but nine months after Germany invaded Poland, Jurika was drawing up bombing plans. At the end of his attaché duty in August 1941, Jurika went to work until October 1941 in the Office of Naval Intelligence (ONI), where he provided the information he had gathered and reported about Japan’s new Mitsubishi Zero high-performance fighter. “Jurika had been a spy in the most traditional sense of the word, and now his experiences were being put to military use,” writes Daso. Immediately following Jurika’s three months with the ONI, in October 1941, two months before Pearl Harbor was attacked, he was assigned to Hornet as the ship’s flight deck and intelligence officer. Then, some two months later, in mid-January 1942, he was consulting with Captain Duncan, the air officer on Admiral Ernest King’s staff, about launching a bombing raid against Japan. Two months later, in March 1942, he was briefing the Doolittle Raiders. Jurika’s military service seemed to be on a stealth-directed course. In his October 27 letter, over a year before Pearl Harbor was bombed, Jurika had changed his wife’s booking from December 12 on the President Cleveland to November 24 on the President Taft because the State Department wanted all wives and dependents to leave Japan. In that letter he also mentioned getting the furniture and silver packed for shipping on the Yawata Maru sailing on November 13. The interview’s transcript says, “Mrs. Rivera Schreiber names her husband’s Japanese informers probably for the first time. She kept silent for over 50 years, fearing very possible retaliations against those people in a society still harboring many diehards.” The Schreiber incident, which was one of the many Pearl Harbor conspiracy theories that have surfaced over the past 70 years, happened in January 1941 when Ambassador Schreiber informed America’s ambassador to Japan, Joseph Grew, about talk of a Japanese attack on Pearl Harbor. 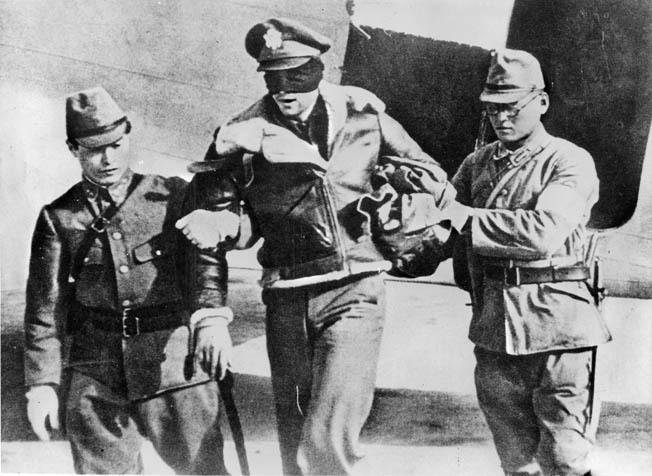 Japanese guards transport blindfolded Lieutenant Robert L. Hite, co-pilot of Plane 16, to a POW camp in China. The pilot, Lieutenant William Farrow, was executed by the Japanese. Jurika arranged for his wife to leave Japan over a year before Pearl Harbor was bombed, while the Schreibers, along with Ambassador Grew and other diplomats, didn’t have such fortuitous timing. After the Doolittle Raid, the Schreibers were put under house arrest; they were finally evacuated from Japan in June 1942 aboard the Asama Maru. If not for the State Department’s orders, Jurika’s wife might have been in the same boat with the other diplomats, which is why Schreiber wondered “how and when” Jurika got notice. Jurika’s personal background sheds light on another perspective of his path to playing such a pivotal role in the raid. According to a June 1945 interview in the Miami News, when asked how he came to be assigned the intelligence role for the mission, Jurika answered, “It wasn’t my fault. I was only six months old,” then explained how his family had resided for years in Zamboanga, the Philippines, while spending two to three months each year in Japan. Jurika’s childhood laid the foundation for his Japanese dossier. His mother, Blanche Walker Jurika, was from California, while his father, Stefan, was a naturalized American citizen originally from Czechoslovakia who started a trading company in 1902 on the Philippine island of Jolo, then moved to Zamboanga. Jurika was born in Los Angeles but grew up in the Philippines and attended schools in the islands, and also in Japan and China. Before the war, Lieutenant Stephen Jurika had served as a naval attaché in Tokyo. He attached medals the Japanese government had awarded him to a bomb dropped during the raid. During the Japanese occupation of the Philippines, Jurika’s mother, his sister Katsy (short for Katrushka), and her husband, Commander R. Parsons (aka Chick Parsons), were all involved in gathering information on Japanese activities. While Parsons used his Panamanian diplomatic status to get his family back to the United States in June 1942, Blanche Jurika, who remained behind in Manila to work clandestinely with the resistance, was eventually executed by the Japanese. There is no mystery why Jurika became one of the heroes in getting the Doolittle Raid off the ground, but why he was drawing up bombing plans a year and a half before Pearl Harbor was attacked, and why the State Department wanted all wives and dependents out of Japan 14 months before Pearl Harbor, opens the door for questions. It takes time for secrets to surface and even longer for them to be answered. 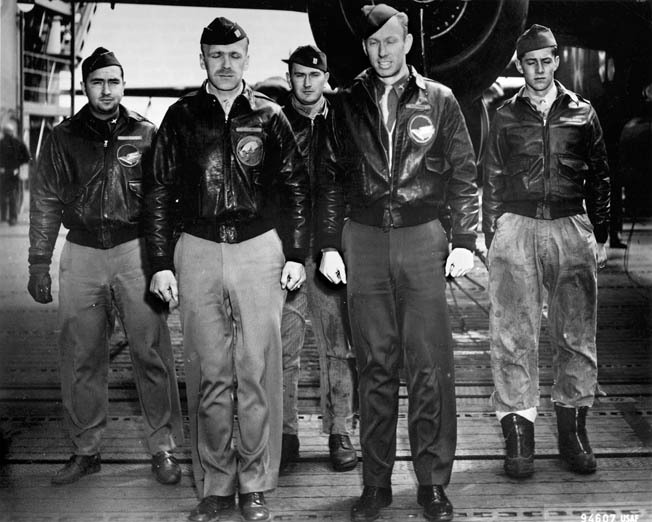 Some 70 years later, the Doolittle Raid still mystifies. Tags Admiral Ernest King, Allies, Axis, China, Doolittle Raid, Franklin D. Roosevelt, Japan, Japanese, Jimmy Doolittle, Mitsubishi Zero, Pearl Harbor, Philippines, POW, U.S. Naval Intelligence, USS Hornet. Since it was a given that there’d be a Pacific war at some point (known even in 1940) AND the government wanted dependents out, there’s no forewarning needed to get Mrs. Jurika out. HE had to stay—it was his job. His wife and ‘stuff’ didn’t. No mystery there! Aircraft 8 is intriguing and I wouldn’t be surprised if our government ordered it….perhaps even hoping to force a rift between Japan and USSR.